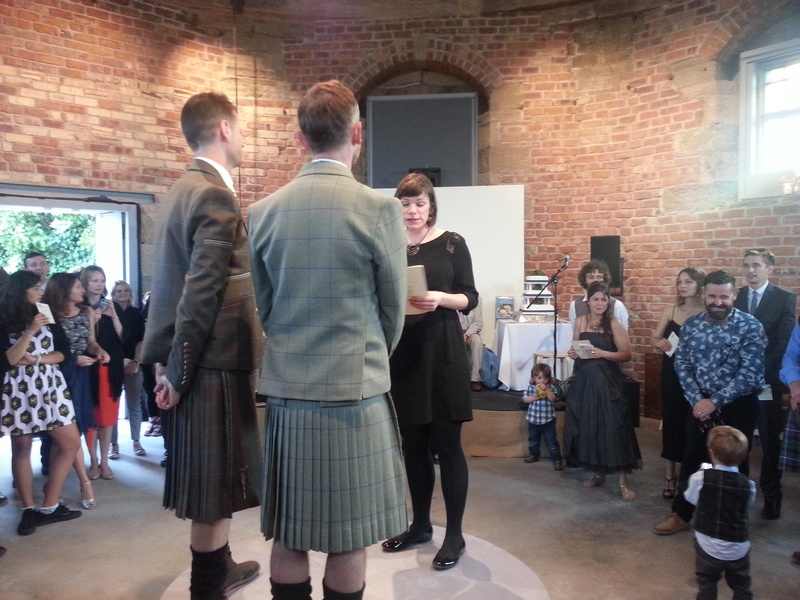 Yesterday I had the huge honour of being a wedding celebrant for two friends. We first agreed I would take on the role almost a year ago, and it feels like a significant milestone has passed. I have had dreams about dropping my notes in a puddle, not being able to be heard over an unfortunately placed bulldozer, and improvising some hideously unfunny jokes. But when it came to it, nerves vanished and I just enjoyed every second. I am still kind of overwhelmed by the experience, plus I stayed up until after 1am, which is unheard of for me at the moment! So I am not capable of offering you a proper reflection on the experience or what it meant. What I know is this: to have such a role in helping two people publicly declare their love and commitment to one another is the greatest privilege I have experienced (and I regularly get to hear people’s deepest dreams for a living! ); to be invited, with my partner, to be part of the whole day at the wedding gave me a profound sense of inclusion and belonging; and, finally, James and Simon really know how to offer true hospitality. It was a day of thoughtful creativity, where every aspect of guests’ comfort was anticipated and fulfilled, and generosity was boundless. Nothing felt flashy or formal. Everything was kindness and gratefully received contributions from friends and family. James and Simon, I cannot put into words how deeply I wish you happiness and fulfilment in your life together. Congratulations, friends!